When I questioned Barbara on her source of funding for the renovations she revealed that she was solely dependent on income derived from visitors to her guesthouses. She had originally come to Antakya in the mid-1970s to establish a Catholic church, now presided over by Fth Domenico, a Carmelite priest. The church backed onto the Taizé guesthouse which she had established subsequently. She’d rented the various rooms and courtyards for several decades. She was by no means assured of keeping them indefinitely. In recent years wealthier individuals and families had begun to buy the older houses for restoration. She worried that her landlord/s might be enticed to sell one or other of the accommodation she rented were an attractive offer made by a prospective re-developer. She worried that her landlord/s might be enticed to sell one or other of the accommodation she rented were an attractive offer made by a prospective re-developer. On my first visit in the summer of 2013 I had met a number of NGO workers involved in the unfolding crisis across the border in nearby Syria (only some 50 km east of Antakya). By contrast in the winter months there were very few visitors. This time around I noticed a few, young NGO-types emerging from one of the guesthouse blocks. Barbara told me they were a French organisation who’d ‘accidentally’ become permanent lodgers. On my second last evening I met a Polish girl called Paulina while eating out with Barbara. She worked for a Polish NGO involved with Syrian refugees. She’d originally lodged with Barbara and for a while the agency had used her premises as a headquarters. This was not ideal because Barbara forbade visitors from outside within her guesthouse commune so they had moved elsewhere once a suitable alternative had been acquired. I’m not sure what arrangement the French NGO had with her. Paulina was a quirky, good-natured girl, probably around 30 years in age. She arrived from an afternoon break in Samandağ on the coast to join us at the Asi café. Barbara and I had already ordered. I chose a side from the limited specials section – some sort of spicy, beef stew. Barbara had chosen a Mexican steak but was informed by our young waiter a few minutes later that it was unavailable so settled for my dish instead. We requested that it not be too spicy when the waiter asked for our preference. As it turned out it was full of fiery, eye-watering peppers. I blinked back the tears, alternating between sips of Effes lager and mouthfuls of stew and bread. Barbara seemed to be more stoic in her approach but admitted in her understated, Germanic manner that it was indeed “quite hot”. As for Paulina, she suffered a gluten intolerance couldn’t eat a dish supplemented by bread. She chose some sort of lamb dish that I’d been considering earlier. By this stage Barbara and I had finally concluded our respective duels with the fiery beef stew. We requested that it not be too spicy when the waiter asked for our preference… As it turned out it was full of fiery, eye-watering peppers. The obviously French-influenced architectural style of the building opposite the Asi Restaurant. Poor, poor Paulina: what did she get? Exactly what we got, that’s what. I was about to interject when Barbara exchanged words with the waiter. She turned to us and shrugged saying something about the absence of lamb in the kitchen. She gestured for Paulina to begin and waved away the waiter. The poor girl looked down at her plate with an obvious lack of enthusiasm. “Ja, they are trying their best I think,” continued Barbara in defense of the restaurant (her choice). Personally, I would have sent it back but that may have been culturally taboo. I really don’t know, except that I really felt for poor Paulina as she picked away at the stew for the next ten minutes with only a glass of wine to extinguish the flames. Her plate of bread sat forlornly to one side. I really felt for poor Paulina as she picked away at the stew for the next ten minutes with only a glass of wine to extinguish the flames. We fared better with the desert at a popular confectionery café just over the Ata Koprüşü (bridge). Barbara and Paulina had several blobs of ice-cream presented in proper fluted ice-cream bowls. I had a square of some sort of gelatinous, starchy pudding which I enjoyed with a blob of vanilla ice-cream. It was surprisingly filling. I asked Paulina if she felt safe travelling alone in the area as a woman. She laughed and made light of it but admitted that she was obliged to check in with her security person before going anywhere. She also confessed to feeling a certain tension in the city. Couldn’t I? I replied that I honestly couldn’t. A little further into the conversation she hinted at the undue attention she got from men as a foreign female and I think this may have been the source of the tension she talked of. What I saw was a bustling city where everyone seemed to be doing something, whether he or she be behind a shop counter on the main street, running a stall or workshop in a bazaar or on a side-street, or simply selling simit (seeded bread rings) or fresh produce on a street corner. In other words it was much like any other Turkish town or city but with its own particular flavour. What I saw was a bustling city where everyone seemed to be doing something, whether he or she be behind a shop counter on the main street, running a stall or workshop in a bazaar or on a side-street, or simply selling simit (seeded bread rings) or fresh produce on a street corner. 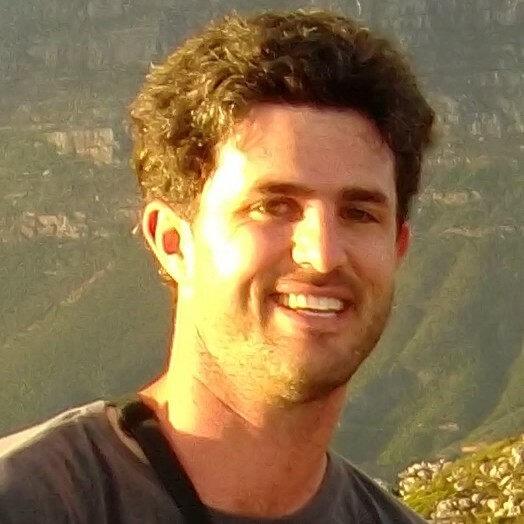 The only other NGO person I spoke to on my trip was an Irishman staying in one of the guesthouses. Barbara had mentioned him before I actually met him. He had an unusual name which sounded like Endar, though I’m not sure how it’s spelt. He had come down from Urfa for a few days. He was working with a Danish organisation, employed as some sort of community therapist or counselor. He looked over-worked. Part of the problem with his current employer he told me was the number of Syrians they had taken on to assist them. “These people are immersed in the problems of other families all day long and then they have to return to crowded houses where they have to deal with the issues of their own families without the luxury of any domestic privacy”. It sounded rather desperate. We talked about the general situation in the region. When I told him that I had managed to purchase some old Iraqi dinars from a Lebanese curio seller in town he shook his head. 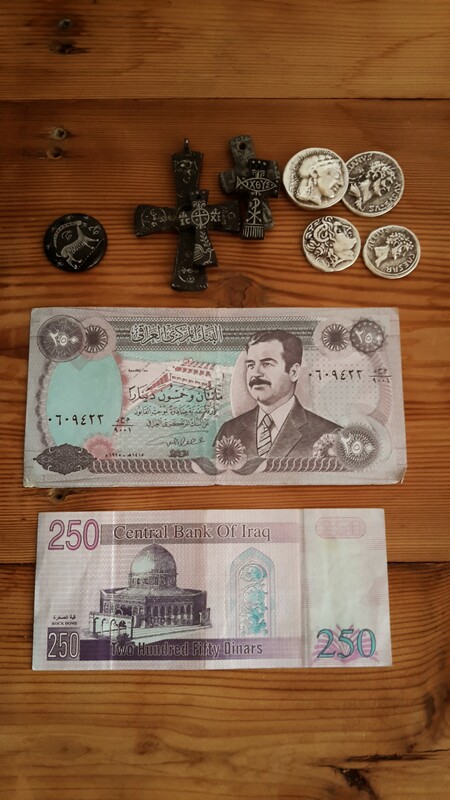 A set of two 250 Iraqi Dinar notes and some other bits and pieces I found in a souvenir shop in town. I asked him if he thought the Western efforts were bearing much fruit vis-a-viz the bombing sorties against the Islamic State. A few months earlier he’d witnessed IS driving up and down the hills across the border south of Urfa waving their black flags. He also claimed that the female accomplice to the recent shootings at the Charlie Hebdo office in Paris had actually been on the same domestic flight as him from Istanbul to Urfa a weeks ago. How had they not picked her up I wondered. A few months earlier he’d witnessed IS driving up and down the hills across the border south of Urfa waving their black flags. He intimated that the situation was spiraling out of control; that Western intelligence just couldn’t keep up any more. He didn’t offer up a solution. I doubt there is any magic bullet except to say that Western intervention in Iraq seems in hindsight to have been very shortsighted. When, back in Izmit, I proudly showed Sofian my Iraqi dinars he nodded and smiled at Sadaam’s handsome suited image on the reverse side. He had said the same about Gaddafi in neighbouring Libya. It seems to me as thought the good/bad, with us/against us, one or the other moral dichotomy offered up by the Bush-Blair alliance has obscured a far more complicated picture; one which the West or indeed anyone else has yet to rationalise in a manner conducive to peaceful coexistence. Take Syria: On more than one occasion I heard people exclaim how surprised they had been at the outbreak of war and indeed the fact that it had dragged on for so long without an end in sight. Barbara herself shook her head sadly when contemplating the state of affairs. “They were a model for us in a co-existence between different religions and ethnic groups. There seems to be a switch in the mind of human beings which can change just like that,” she continued. “We are all very shocked about what’s happened in Syria” (she pronounced Syria as Soo-ree-ah which is, I think, as it is in the Arabic tongue). “They were a model for us in a co-existence between different religions and ethnic groups …” “We are all very shocked about what’s happened in Syria” (she pronounced Syria as Soo-ree-ah which is, I think, as it is in the Arabic tongue). “And why did you choose Antakya?” I asked her. She expounded on the fact that it had a long history of religious interaction and something someone of religious importance had said to her about it being ‘ideally’ situated in this regard. I like the fact that the Taizé community worship chooses to incorporate ‘wisdom readings’ derived from other religions or sources of spiritual enlightenment. Barbara encouraged me to find something from African folklore to share. I am not well versed in it but I did have a book of poems written by a man who had lived something of a hermit’s life in Zimbabwe. He had lived with and cared for lepers and his poems were an unusual mix of inspirations, from English literary traditions to biblical scripture to the African landscape and the people therein. I chose one of them to share the one evening. I think it went down well. In any event I left the book and another in her library for future travellers to read. In turn I took a book written by a contemporary novelist to read back in Izmit. On the final day of my stay in Antakya, a Sunday, I wanted to attend a Mass at the next door Catholic church, the one that Barbara had originally established. They usually rang the bell at 0830 on weekdays but today they rang about half an hour later. Nevertheless, as I discovered on previous occasions, the imposing metal doors at the entrance remained closed. There was a buzzer to the one side but after ringing it and waiting till the intercom automatically switched off the connection to the inside I decided to try the Greek Orthodox Church on Hurriyet Caddesi instead. I was fortunate to find that the service was just getting underway when I arrived with several other members of the congregation. I explained to a man at the gate that I was a foreigner and after a quick appraisal he opened the gate to admit me,albeit without a smile. I was concerned that I might stand out once in the church but no-one paid me undue attention. I had only attended one or two Greek Orthodox services previously, back in Harare. Zimbabwe still has a surprising number of Greeks. My father was born into the faith but had not been an active participant until it was required that he do so in order to facilitate his application for a Cypriot passport. Like his sons he adopted Catholicism, my mother’s faith. In fact, he became an enthusiastic proponent of the faith, even if he didn’t always put its teachings into practice. My brothers and I had considered it a bit of a joke when he suddenly went through all the pomp and ceremony of adopting Greek Orthodoxy towards the end of his life. Shortly before he died back in 2006 he even married his long-time mistress and legal secretary in a home ceremony overseen by Father George of the Harare GO establishment (coincidentally our parish priest in the Catholic diocese had also been a Father George). Ultimately there were two funeral ceremonies for my father – one at our local Catholic parish, and another at the Orthodox cathedral. Along with another funeral and a wedding or two that was about the extent of my engagement with the GO church. 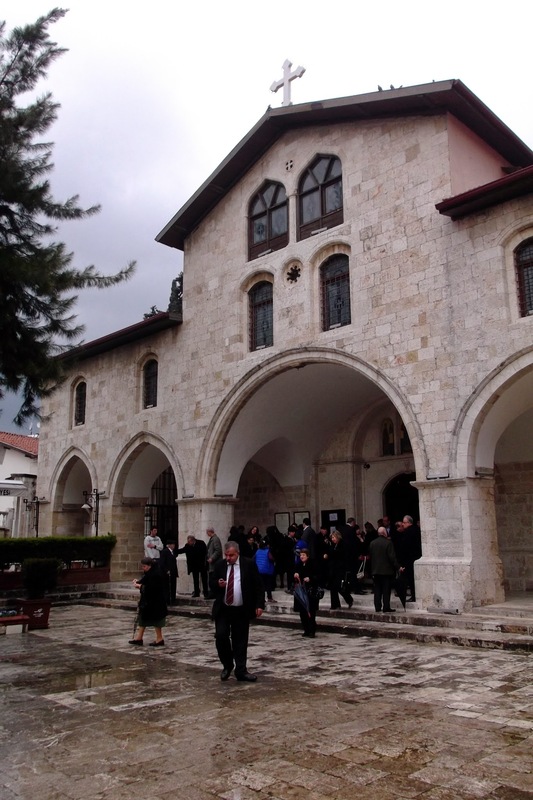 The congregation of the Greek Orthodox church emerge after the service to a wet and rainy morning. 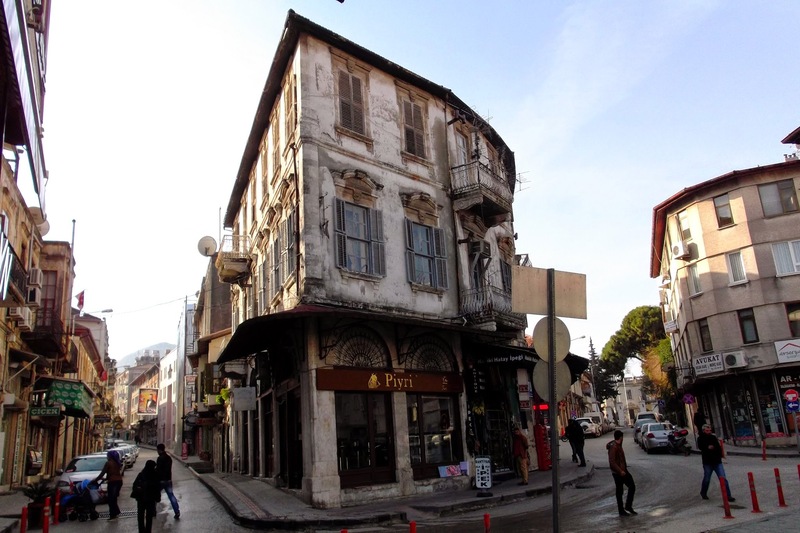 On this occasion, in Antakya, I found the surroundings somewhat familiar. There was some attractive iconography and lots of gold leaf embossing the visages of Jesus Christ, Mary, the Saints and other figures of religious significance. The alter was set back behind a screen comprised of the pictures I have just described and other embellishments. The priest, a middle-aged man, conspicuously clean-shaven, presided over the Orthodox Mass. He moved back and forth between a lectern in front of the screen and the alter set back behind it. I found the surroundings somewhat familiar. There was some attractive iconography and lots of gold leaf embossing the visages of Jesus Christ, Mary, the Saints and other figures of religious significance. I tried to soak up the sung liturgy which it seemed was recited in a mixture of Arabic and Turkish (Barbara confirmed this when I asked her late). This surprised me but, in retrospect, language has important connotations in Turkey. Whilst it wasn’t very long ago that Turks wrote in Arabic calligraphy (prior to Ataturk’s reforms) the language itself is rich in Arabic words. Greek on the other hand was the language of a traitorous minority who sort independence from Ottoman Turkey in Anatolia. Perhaps I’m going too far in my analysis. It’s just a guess. All too soon Sunday evening came along and my final hours in Antakya were upon me. I finally got to enjoy the environs of the Mistik Cafe next door which I had been eyeing with curiosity ever since I had walked past the entrance earlier in the week. There was a spacious courtyard with several orange trees, one of whose branches hung over the wall, laden with succulent round fruit. I finally got to enjoy the environs of the Mistik Cafe next door which I had been eyeing with curiosity ever since I had walked past the entrance earlier in the week. Usually in the evenings there were an assortment of young adults and teens drinking coffee and smoking Nargile, as one could observe in just about any Turkish town or city. It was one of a number of cafes in the old town, testament to its growing appeal to the younger, more Bohemian members of society. This evening there were only one or two tables occupied, perhaps due to the rain which had been falling intermittently most of the day. We went upstairs to the dining area where I had an excellent tavuk (chicken) shish. The food was not only cheaper than the Asi Restaurant from the previous evening but better presented and, most importantly, you got what you asked for! The food was not only cheaper than the Asi Restaurant from the previous evening but better presented and, most importantly, you got what you asked for! We sat and chatted for some time after the meal. I gleaned some interesting morsels of information from Barbara about the situation as regards religion and the important role played by the relevant ministry/council in Ankara in mediating its practice and instruction in schools. I admired the secular nature of the Turkish state but wondered at the challenges presented in balancing theological laws and traditions with the secular constitution and judiciary. It wasn’t only with regard to the use of, and restrictions imposed in, Arabic language instruction in Hatay, but also the broader monitoring of Islamic Sharia as practised by more religious Muslims. I admired the secular nature of the Turkish state but wondered at the challenges presented in balancing theological laws and traditions with the secular constitution and judiciary. There was a slight misunderstanding as regards the terms of my stay which was a bit unfortunate but I suppose we should have discussed this at the beginning of my stay. In any event the daily rate was hardly unreasonable at approximately 10 pounds per day. I said goodnight to Barbara after settling up and returned to my room to complete the formality of packing up. Barbara is a quiet, serious lady; firm but not unkind. I think she is sensitive to other people’s opinion and feelings but does not always verbalise these thoughts. I would like to visit the guesthouse again in the future and hope that after all the years she has spent in building her community will continue to bear fruit. I would like to visit the guesthouse again in the future and hope that after all the years she has spent in building her community will continue to bear fruit.